The two small round headed windows are original, along with the two square headed ones in the north wall and one high up in the west wall. The lancet windows are probably medieval and the large east and west windows are dated to 1822. The large window in the south wall is probably of a similar period. 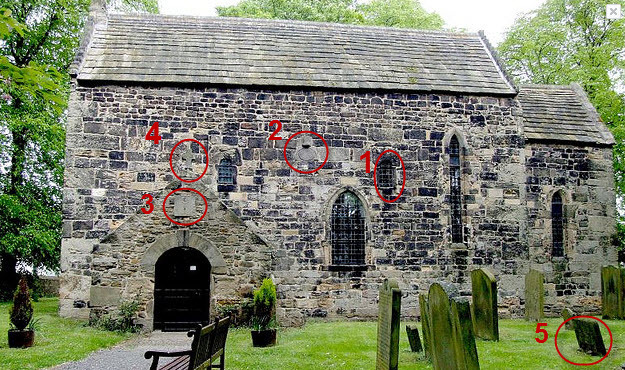 The 7th century sundial possibly predates the church and was set in the wall as the church was built. It is believed to be the earliest Anglo-Saxon sundial in its original place in the U.K. There is a separate information board and leaflet on the sundial. 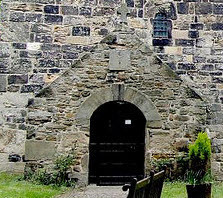 The Porch is a medieval addition built of random stones rather than dressed stone like the church. The custom in the Middle Ages was for couples to be married at the church door rather than in church, so a porch would protect from the weather. Another custom was that meetings were held in the porch as, after the Norman Conquest, business meetings were not allowed inside the church. The Sundial above the entrance to the porch is believed to date from the 17th Century. The cross above the sundial is Frosterly marble, probably Celtic and older than the church. It was probably part of a preaching cross as are the stones in the porch and the cross behind the altar. The gravestone on the right of the path is dated 1703. The leaves represent the tree of life and the hour glass the span of life. The rose represents the church while the skull & crossbones represent the Resurrection.